Are you bleeding-edge, blazing a trail or beginning a journey? Here’s something that won’t surprise you. As digital technology continues to revolutionise the world, business leaders and marketers are being challenged to transform or risk losing market share. Unless you’re a start-up, chances are you are facing major decisions in terms of replacing or reengineering Information Technology (IT) platforms, integrating new marketing services and applications, and understanding the massive amounts of customer data being generated throughout your business and brand world. So digital marketing, and data driven marketing, are important. Regardless of whether you’re bleeding edge, blazing a trail or beginning a journey, there will always be more to consider in this exponentially evolving space. At TrinityP3, we recognize that the terms ‘digital’ and ‘data’ are now threaded through many different parts of the marketing funnel. Best practice lies in seamless integration, worked in many directions. It is no longer about adding the ‘digital’ and ‘data’ bricks to your marketing wall. For this reason, we eschew a ‘digital and data’ product suite. Instead, we have a number of existing services across our portfolio that will naturally encompass digital and data-driven marketing as part of the whole, or which can be tailored to consider specific aspects of your digital and data needs, as required. More importantly, we have consultants with the specific experience to help. Do you have the right threads, and the right needles? It’s the biggest question. We can all talk digital and data strategy; but in reality, often some of the fundamentals are lacking. We want to help you obtain the right threads, and the right needles, to ensure that your digital and data performance is optimized in context of your stage of the journey and beyond. Before any digital decisions are made it is critical to align digital activity to your overall marketing strategy. This is where we see many businesses stumble as they have competing forces within the organization, which creates confusing experiences and potentially dissatisfied customers. We have seen it all: fully integrated teams; silo digital departments; sub-silo social media and mobile units; separate customer experience and data divisions; and CMOs scratching their heads as to what everyone actually does. With the rise of ‘Big Data’ through a myriad of new digital media touch points, marketers have struggled to gain a consistent and clear single customer view. TrinityP3 can help you uncover all relevant data sources within your business, as well as facilitate a prioritization process to agree the most valuable data that will allow you to drive better business outcomes. Ask us about our data health check. Technology is advancing at an ever-increasing rate. From cloud services to automation engines, programmatic media to the Internet of Things. It’s a different world that can easily confuse even the most experienced marketers. “Why do you have all the current digital agencies on your roster?” This is a question that we ask every client. And the answers are invariably confused. Clients that operate in silos often have competing agencies managing separate parts of the business, resulting in multiple search agencies, multiple technology vendors, multiple digital creative agencies, multiple development teams, and multiple reporting frameworks & dashboards. The result – lots of bricks in the marketing wall with nothing holding them together. This scenario represents the ultimate ‘digital bolt on’ scenario. 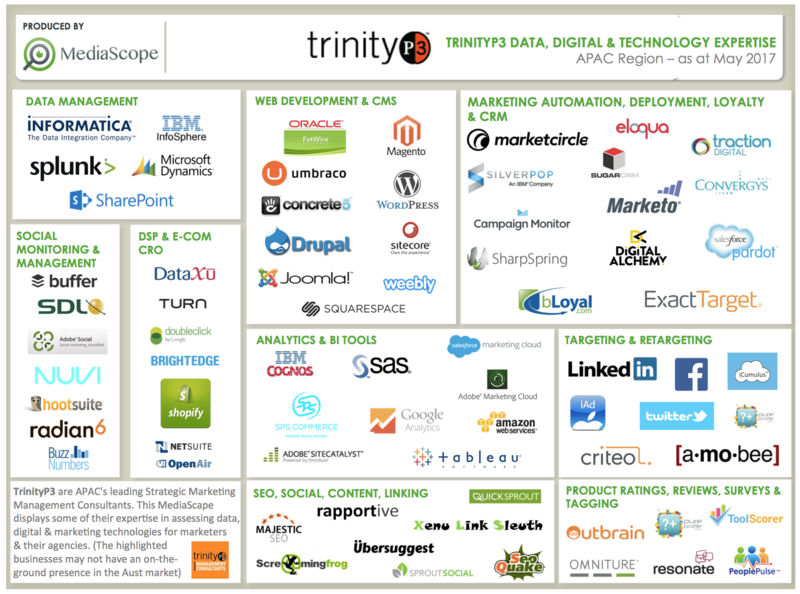 TrinityP3 can help restructure &/or rationalize your digital agency roster, plus get your marketing teams collaborating and knowledge sharing again. We’ve provided a lot of information on this page. But we don’t pretend to encapsulate the entirety of this huge topic here. We are willing and able to tailor any of our services to your specific requirements. So, if you’d like to talk to a real person about your digital and data consultancy requirements, please click here – we’d love to hear from you. To conclude this look at how we can help you with your digital and data performance we have put together this graphic which shows the tools, systems and platforms that TrinityP3 consultants have a high level of expertise with. Here, TrinityP3 Consultant, Anton Buchner, talks about the challenges facing customer centric relationship marketers and how How can TrinitP3 can assist with data, digital and improved processes. Technology is impacting all areas of advertising and marketing including production. Here, Darren Woolley talks about why you need to rethink, restructure and reengage in the way you manage production, and how TrinityP3 can transform your production structure and process to fit your future needs now. 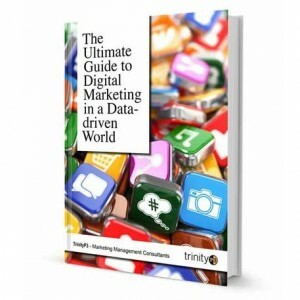 This comprehensive Guide will not only demystify the world of digital and data by explaining how it works, it will also help you put some logic back into your marketing approach. TrinityP3 genuinely orient themselves in commercially viable solutions for sustainable clients and agency partnerships. They focus on getting the right relationships, right people and right terms.